Becky DeLong received Best of Show during the 2017 Art in the Village hosted by the Riverbend Arts Council. 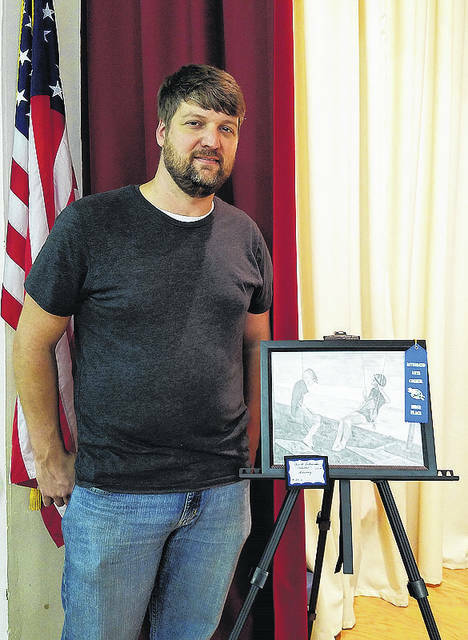 Chuck Lukowski received the People’s Choice award for his drawing at the 2017 Art in the Village. 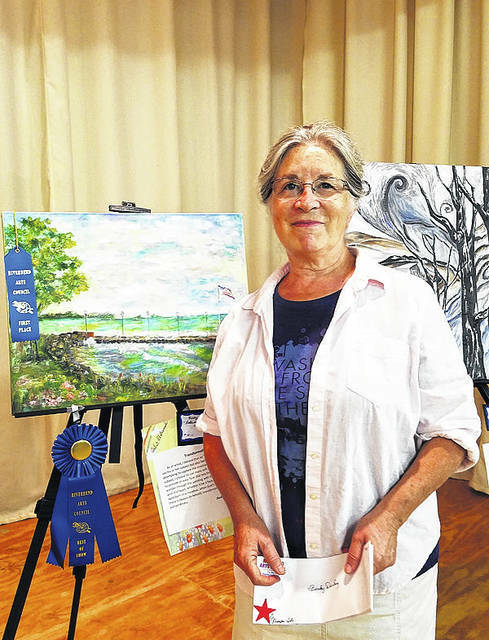 MIDDLEPORT — The 9th annual Art in the Village art show hosted by the Riverbend Arts Council is scheduled for Oct. 13. Art in the Village is a professionally judged art and photography contest and exhibition which takes place each fall at the Riverbend Arts Council located on Second Avenue in Middleport. This year’s theme is “Appalachian Heritage.” The event will take place from 10 a.m. to 4 p.m. on Oct. 13. There will be judged divisions for students, adults and professionals. Art categories include drawing, oil, acrylic, water colors, mixed media. Photography include color and black and white in the size of either snapshots and enlargements. There are categories for people, places and things. In addition, there will be a “Think Outside the Box” competition for group art projects. For Think Outside the Box, the groups will receive a “box of randomness” to form into a sculpture. “Your masterpiece can be humorous, elegant, jaw dropping, sky high, itsy bitsy, extremely detailed, straight forward, etc. The only stipulations are that you use all materials, consider the theme (Appalachian Art), work as a group and have lots of fun creating your 3-D masterpiece,” according to the contest rules. To register for the Think Outside the Box contest contact Peggy Crane at 740-416-9272. Entry forms must be postmarked by Oct. 1 and can be mailed to Riverbend Arts Council, PO Bo 27, Middleport, OH 45760. For questions regarding painting contact Wendi Miller at 740-416-4015 or wendimiller_teaford@yahoo.com. For questions regarding photography contact Randy Houdashelt at 740-992-6258 or rehoudashelt@gmail.com. https://www.mydailysentinel.com/wp-content/uploads/sites/14/2018/09/web1_Art-1-best-of-show-becky-delong201710981827429_ne201891420317708.jpgBecky DeLong received Best of Show during the 2017 Art in the Village hosted by the Riverbend Arts Council. https://www.mydailysentinel.com/wp-content/uploads/sites/14/2018/09/web1_Art-2-people-s-choice-chuck-lukowski201710981829971_ne201891420318920.jpgChuck Lukowski received the People’s Choice award for his drawing at the 2017 Art in the Village.